Back in 1997 I had the opportunity to visit Jamaica for two weeks. The first week I taught squash at the Couples Resort in Ocho Rios, in exchange for an all-inclusive stay for my cousin Zack and me. Mostly we hung out at the resort, swimming, sailing, eating, drinking, making friends, and playing squash. We also took a day trip to Dunn’s River Falls. The second week I ventured out on my own to explore the rest of the island. My best memories are the Bob Marley House in Kingston and the town of Port Antonio. I wasn’t planning on going back to Jamaica, but that was before I met someone from Jamaica. By coincidence, he’s from Port Antonio, my favorite town. He’d already been planning a trip back home to visit family and friends, so I hopped onboard for the ride. We arrived at Kingston International Airport on October 2, 2013. I was happy to see this poster about respecting the environment. The University of the West Indies in Jamaica is one of the premier universities in the Caribbean. Jamaica prides itself on education, star athletes including Usain Bolt, the fastest man in the world, Bob Marley and reggae music, rum, white sandy beaches, and last but not least, their Olympic bobsled team, featured in the film "Cool Runnings." Of course, the most famous Jamaican worldwide is Robert Nestor Marley, more commonly known as Bob. The funny thing is, Bob Marley is more popular in other countries. Rastafarians are the minority in Jamaica and dreadlocks are not as common as foreigners believe. Each year, the Jamaicans celebrate Heroes Day, honoring 7 heroes including one woman, Nanny of the Maroons (center), who fought the British in guerrilla warfare from the Cockpit Mountains. Paul Bogle (left) is supposed to have led a demonstration in Morant Bay, which was classified as a rebellion by the British. Bogle was later convicted and hanged for this demonstration. The international airport is named for Norman Manley (right) who was a later prime minister and cousin of Bustamante and father of Michael Manley, another prime minister. (left to right): 1. The first Jamaican prime minister after independence in 1962 was Alexander Bustamante. 2. George William Gordon was a Quaker who was executed along with Paul Bogle in Port Morant. 3. Marcus Garvey was blacklisted in American for his early work in civil rights activism in the U.S. and Jamaica. 4. Sam Sharpe, an abolitionist, instigated the 1831 Slave Rebellion and was hung a year later. By 1838, slavery was outlawed in Jamaica, nearly 30 years before Abraham Lincoln's Emancipation Proclamation in the U.S.
It’s obvious that the Jamaicans value education. Everywhere you look you see neatly groomed school kids in uniform. 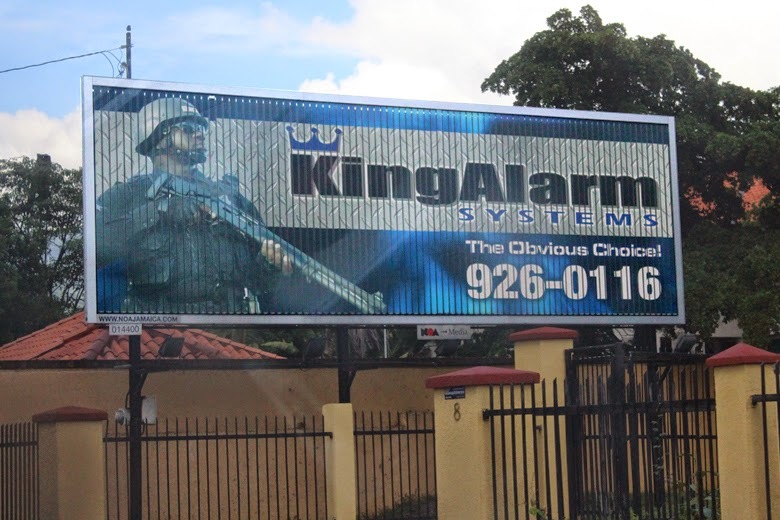 There are also a lot of billboards and ads for alarm systems in Kingston, with photos like this one with scary-looking guards. Overall, I didn’t feel any threat while traveling around Jamaica, although I'm sure there are neighborhoods I shouldn’t go into. We passed by the famous Trench Town where Bob Marley spent part of his life, but we didn't walk around. As I mentioned, Jamaicans are famous for success in athletics. The two most popular sports are football (called soccer in the U.S.) and cricket, which they learned as a British colony. Emancipation Park was built in 2002 on the 40th anniversary of Jamaican independence from England. These huge statues represent the free men and women of Jamaica. It’s hard not to notice how well-endowed the models are. We also made a trip to the Kingston Zoo. The review online made the zoo sound really bad, so I was pleasantly surprised that it was quite clean and the animals appeared well cared for. Altogether we spent a week or more in Kingston, mostly doing family stuff. We spent another week making a big loop through the hills to Port Antonio and back along the coast through Port Morant. And the last week we traveled around the rest of the perimeter of the island, including the beach resorts of Negril, Montego Bay, and Ocho Rios. Jamaican Food and Recipes - YUM! !